GEOFLOR is a grid that can turn a turf into a parking lot or a driveway. 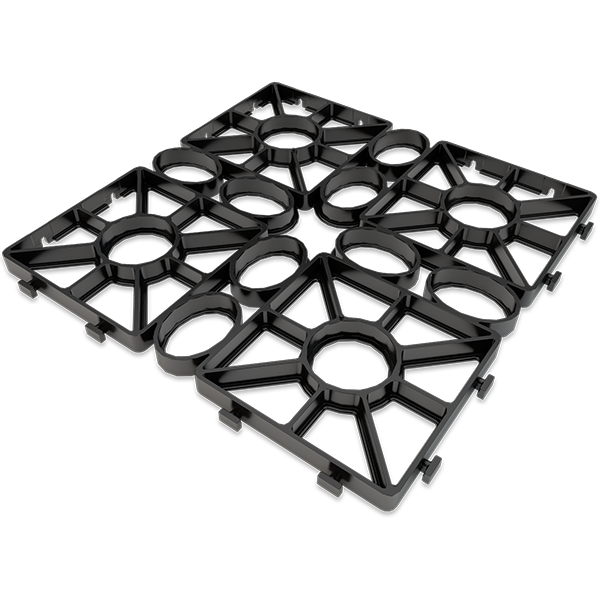 It can be used to build grass parkings with special bearing underlayers, without the previous insertion of a specific surface. In order to build green walkways and parkings, this grid can create any type of walkable turf. Its large cells allow it installation directly over the existing turf. It can instantly protect the lawn and the root system, allowing the transit of vehicles immediately. This grass grid is ideal to turn a turf into a green parking lot or into a driveway. The result is always perfect because GEOFLOR large holes and base allow the grass to fill the gaps quickly without any damage. It is also possible to use it as a temporary protection of the lawn in case of sporting events, fairs, concerts and general events. It is possible to make the through turf and walkable even in great artistic value areas, the grid does not have any impact on the functional and aesthetic appeal. Building green walkaways and parkings with GEOPLAST allows the grid reinforces the grass and collaborates with it, protecting the root system.